SIMON Peacock was likened to Tony ‘The Tornado’ Drago after his quick-fire 5-0 whitewash of Steve Ashton in the Cuestars South Wilts Snooker League. The speedy 42-year-old (pictured) from Winterbourne Gunner is now joint league leader with three wins out of three. Ashton, who played a frame against the Maltese professional about 25 years ago, said: “Simon makes Drago look like a slow player. Drago holds two snooker records. He won a frame in three minutes in a pro-tournament in 1988 and put together a century break in 210 seconds during the 1995 UK Championship. Elsewhere at Salisbury Snooker Club, Trevor Pittman felt the backlash of John Hunter’s first defeat in a decade in his previous match. The nine-time champion from Andover went on the rampage with breaks of 85, 72, 51 and 44 in a 5-0 win. 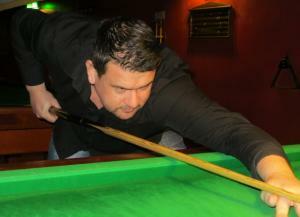 Joint league leader Anthony Rice (Fordingbridge) described turning over Neil Herd (Frome) 5-0 as “a massive win for me”. Callum McDonald (Bishopdown) picked up a first win bonus of the season. The 16-year-old edged Paul Burt (Britford) 3-2. And Neil Carroll (Rownhams) reckons he “scored well every time I was in” during a 5-0 victory over David Rice (Fordingbridge). Results:John Hunter 5 Trevor Pittman 0, Neil Carroll 5 David Rice 0, Anthony Rice 5 Neil Herd 0, Paul Burt 2 Callum McDonald 3, Steve Ashton 0 Simon Peacock 5, Richard Arnold P Richard Swaffield P.